The Sony a77 II body only kit with a free Sony VG-C77AM battery grip is now going for $900 with free shipping at B&H Photo and Amazon by Amazon itself (limit 3). Meanwhile the a7 ii with 16-50mm f2.8 and VG-C77AM battery grip goes for $1500 at B&H Photo and Amazon by Amazon itself (limit 3)… The 16-50mm f2.8 lens goes for $750 on its own. Adorama is offering four free accessories (Nikon WU-1b wireless adapter, extra Nikon EN-EL15 battery, Nikon camera bag with Nikon School DVDs, 16GB Sandisk SDHC) and 4% promotional rewards with the purchase of these three Nikon D610 DSLR kits: body only ($1600) or w/24-85mm VR ($2000) or w/28-300mm VR ($2400). Included in the camera sub-section of the eBay Deals is the new condition Canon 50mm f1.8 II lens offered for $98 with free shipping by eBay seller RedTag Camera (99.9%). There is no mention of a warranty on the product page and they are not an authorized Canon dealer, so this is likely an imported / grey-market model. As such, it is not eligible for the Canon mail-in rebates. This is a simple prime lens in double figures, so, for some, this may not be an unreasonable risk to take. The blessed by Canon USA model goes for $105 after a $20 mail-in rebate at authorized dealers (eg B&H Photo, Adorama). Not sure how many people would want to go through the hassle of a mail-in rebate for $20, unless they are buying other Canon DSLRs and lenses that are also part of the mail-in rebate promotion. So if you are interested in this lens, the trade-off: imported vs mail-in rebate. We blog, you decide! Here comes a December surprise! Canon announced the brand new Canon EOS C100 Mark II Cinema Camera with Dual Pixel CMOS AF (Body Only). It is expected to arrive by the end of the year, and it is available for pre-order for $5500 at B&H Photo. If you only want a Nikon DSLR body, and you are comfortable buying imported (gray market) models, you can get the new condition imported (grey market) Nikon D3200 body only for $265 with free shipping when you use coupon code Loyalty10 (= $10 off) at Abe’s of Maine. Imported = no warranty from Nikon USA. Adorama is offering a free one year New Leaf Spills and Drops warranty on select cameras and lenses from Canon or Nikon or Sony. 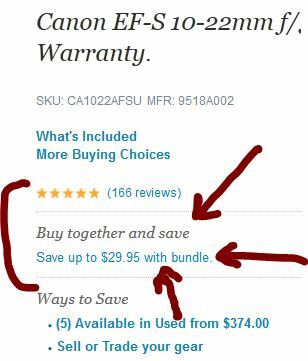 To get this, go to the individual product page of a camera or lens, click on the small link under “Buy together and save” and manually add the New Leaf warranty to your bundle. This is on top of the standard manufacturer warranty, since most manufacturers don’t cover spills and drops. Then press the green “Add Bundle to Cart” button on the right side of the page to add to cart and proceed to checkout. Another trip to the latest eBay Deals find a high-risk high-reward option. 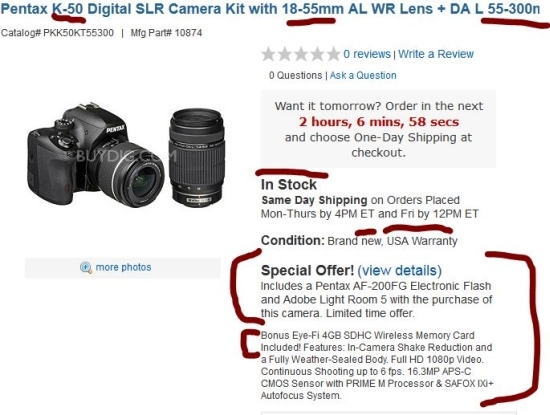 The imported Canon 1D X body only is offered for $4700 with free shipping by eBay seller GetItDigital (99.4%), wiht a limit of five per shopping cart. This camera is imported (grey market), so you don’t get warranty from the manufacturer. The seller, Get It Digital, offers their own equivalent one year warranty. High risk because this is an expensive professional DSLR, high reward because it is around $1300-$2100 less than the blessed by Canon USA model which goes for $6800 ($6000 after mail-in rebate) at Amazon and B&H Photo and Adorama and BuyDig. Over 130 imported 1D Xs got sold so far through this listing. Again, please note this is an imported model without a Canon USA warranty. If you are not mesmerized by the 7D Mark II, the original 7D is still around and it is on sale for with the 28-135mm lens for $1100 at B&H Photo (free extras, 2% rewards) and Amazon by Amazon herself (no extras; limit 2). This daily deal expired… Best Buy is trying something slightly different. They are bundling a free 8-inch digital picture frame (along with other freebies) with their Canon 60D w/18-135 and 70D w/18-135mm bundles as part of their Sunday Deals of the Day. The prices are the standard ones, 60D w/18-135 for $1000, 70D w/18-135 for $1350. The freebies are: 1) 8-inch VistaQuest Digital Photo Frame ($30 on its own, with 4.1 out of 5 based on 140+ reviews), 32GB Sandisk, Lowepro Toploader, 67mm filter, and HDMI cable. Offer ends by the end of day on Sunday 11/30/14. The Sony a58 A-mount pellicle-mirror APS-C camera with the 18-55mm and 55-200mm lens along with Lightroom 5 is offered for $480 with free shipping and free returns at Groupon Goods. IMPORTANT: under Options (right side of the page over there, below the green BUY button), you must select the Kit with Lightroom! I can’t create a link with the Lightroom pre-selected. The default option is without Lightroom and goes for $450. Also included is a case and 16GB card. The Pentax K-3 body only with the BG-5 battery grip included by the retailers in the box for FREE is going for $800 at B&H Photo and Adorama (where if you click on “Buy Together & Save”, you can add the 50mm f1.8 lens for just +$80). The Pentax K-50 is available in three colors and three kits, making price-checking and deciding a bit of a project. 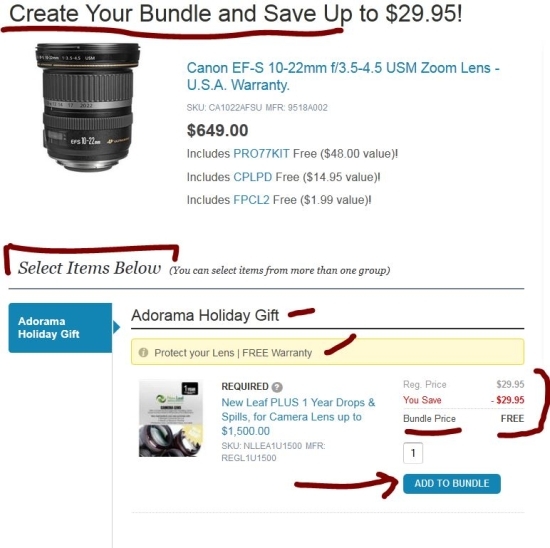 But it may be worth the time because Adorama has many offers and some of them come with the AF-200FG for free (automatically included by Adorama – when you see this mentioned right below the price on the right side of the page). Be sure to pay attention to each individual listing as there are many and each has a slightly different offer. The action starts at $367 with the K-50 body only kits. The black is out of stock (but you can still order it) while the Storm Trooperish White is in-stock. However, in terms of pure value, for $400 you can get the K50 body only kits with a $50 Adorama gift certificate and a 4GB EyeFi memory card in black and white and red. The K-50 with 18-55 kits start at $450 in the exotic colors (no free flash) but at $457 for the standard colors (white, black, red) you get the free flash and 4GB EyeFi card. The K-50 with 18-55 and 50-200 two lens kits go for $550 and they too come with the free flash and 4GB EyeFi card in the usual white, black and red colors. + Canon 6D Body Bundle for $1520 after $650 MIR; includes 6D body, Pixma Pro-100 printer, Canon semi-gloss paper, 32GB Lexar SDHC card, spare Canon LP-E6 Battery pack, Adorama slinger bag. K-curious? Anti-anti-alias-filter curious? Adorama is currently offering the new condition Pentax K-5 IIs body only for $500 with free AF-200 Flash (included automatically by Adorama) and free 2-day shipping and 4% rewards. The Free Flash is mentioned right below the price on the right side of the page. This is a very limited time offer! B&H Photo fans, the Canon 7D Mark II body only kit is now in-stock and shipping for $1800 with free next day delivery.